While it is possible to assign poses to images by scanning a pose barcode in CapturePost or importing a text file (see Assigning poses to images in CapturePost and Importing poses with a text file), for the most part, poses are assigned to images in Poses Mode. 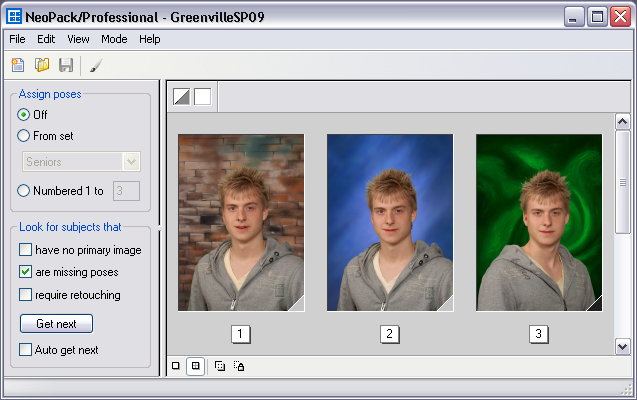 By default if multiple images are matched to a single subject the software will only use the last image in production. This image is termed the primary or main image. As an alternative to the last image, the operator has the ability to mark any of the other images as the primary image. This can be done in either Match Mode or Poses Mode or even in CapturePost. No matter how many images are matched to a subject, by default the software will only use the primary or main image for production, printing and exporting. To make use of the other images it is necessary to assign poses. This is (usually) done in Poses Mode. Assigning poses allows for better use of a subject's images. Proof sheets, for example, can be created displaying each subject's pose and pose number or label. The customer can then order a particular pose or poses. Poses Mode can be used to assign either pose numbers or pose labels to subject images. the images must be matched to a subject before poses can be assigned. For an image to have a pose assigned it must therefore be matched to a subject. 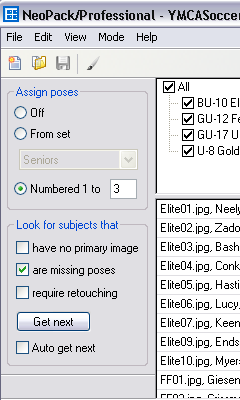 It is possible to automatically assign pose numbers for each subject matched to more than one image. Each pose will be labelled 1 through to n depending on the number of poses matched to each subject. 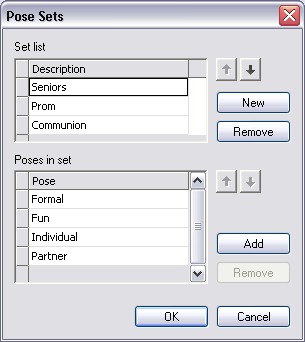 To auto assign poses simply go to the Edit menu and select Auto assign poses or use the Ctrl-U keyboard shortcut. Poses numbers will be assigned in image order. First image is pose 1, second image is pose 2 and so on. If poses have been manually assigned to only some images, auto assigning poses will assign poses to the remaining images beginning with next available pose number. It is not possible to auto assign pose labels. Poses will be assigned for all images for all subjects. Pose numbers are exactly that - numbers beginning with 1. Pose labels are alpha-numeric labels and can be used to give a more descriptive label to the image such as Formal1, Full Length, Fun Shot etc. Pose labels are defined as a set. It is possible to define more than one set of pose labels. The user could, for example, have a set for Formals another for Proms another and another for Communions for example. Figure 4: Manually assigned poses. Note the user defined order for the pose numbers. It is not necessary to assign poses to every image for a subject. For example you may have three images per subject but only wish to use two of the images.